By 8am, all the girls were awake and busy piling on winter coats, socks and heat packs. 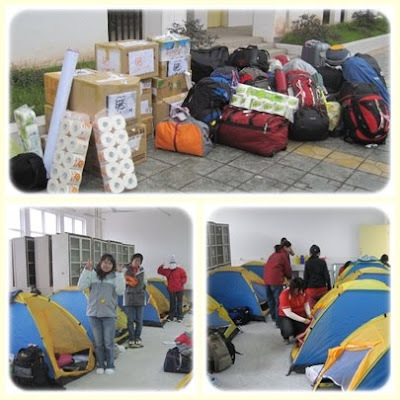 After the first night spent in the camping tents, the boys complained that it was too cold (yes it was from the boys, granted they were placed on the first floor and the girls were in the room on the second floor), Jinnie and Kian Seng (aka Ah Seng) decided that it would be best for the team morale if we were to move into a more comfortable and warmer sleeping place. 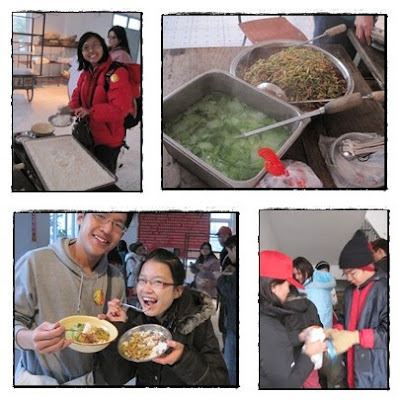 We then proceed to walk from the school to Nong Jia Le (农家乐) for breakfast. 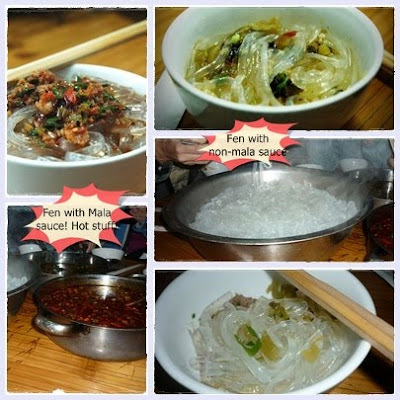 To our delight, it was really delicious Fen (粉) which is a more chewy version of our own glass noodles, coupled with the famous Mala sauce and Non-mala sauce. 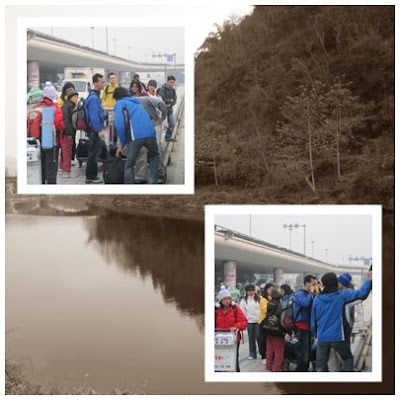 After breakfast, Jinnie, Ah Seng and a couple of others followed He Zhu Ren (何主任) to check out our new possible accommodation, whilst the rest trotted back to school. 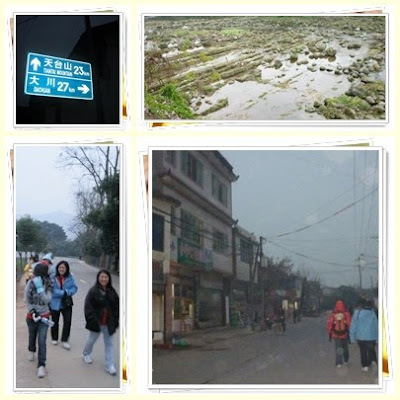 You Zha (油榨乡) is really a very peaceful and serene village, except the honking of the vehicles that would mercilessly disrupt the quaintness of the village. 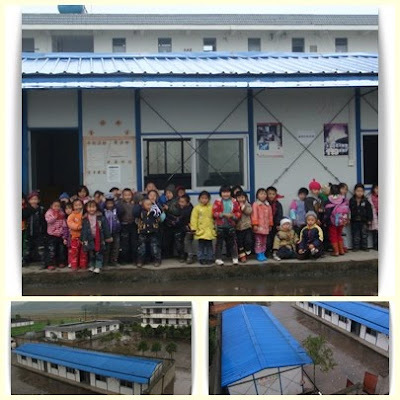 The school is located on the outskirts of the little village, easily a 1.2 - 1.5 km walk from the central market. We braved the gushing winds and winter cold by walking briskly, drawing curious stares from the locals as they watched us march our long procession. 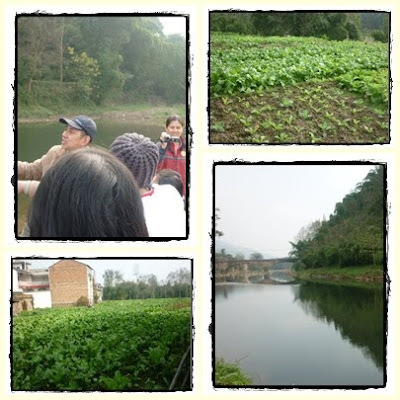 It all seemed very surreal - ancient architecture and acres of greens lined the roads; ducks in the steam; hens, dogs and little children walking alongside with you. 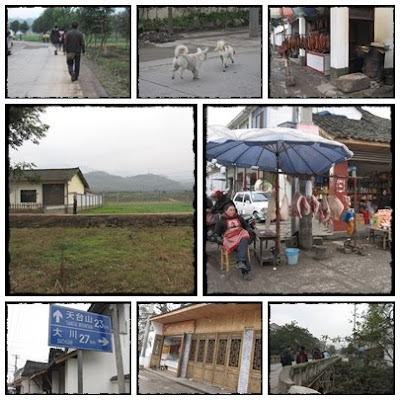 Later, Ah Seng and Jinnie had decided to move to the motel-inn (旅馆), and thus began our everyday walk of 5-6km. (Inn to school, School to inn for lunch, from inn back to school and lastly, from school back to inn for dinner and retire for the night). As the days progressed, the sights did not change, but little things did. 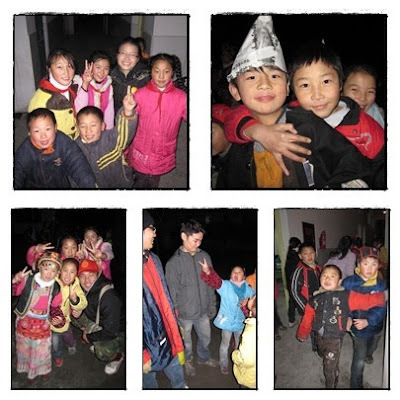 Sometimes, we may be greeted by loud chirpy voices of "老师早！" , following which the children, suddenly seemed embarrassed by their boisterous act, laughed and ran off towards the direction of the school. Along the way we did more shopping for the daily necessities (note: Khoang carried 24 bottles of mineral water by himself ! Khoang, you're the man!) , laughed, talked, practised our Dikir Barat, shared 麻辣土豆 (or mala fries), distracted and entertained ourselves from the cold by taking sudden jumping pictures and most importantly, built our camaraderie. It was only on retrospect, that such a daily mundane routine would emanate such a sense of loss and longing. We reached school at around 9.45am. Following which, PnP went to check out the library (since PnP Peeps had visited the dormitory yesterday). 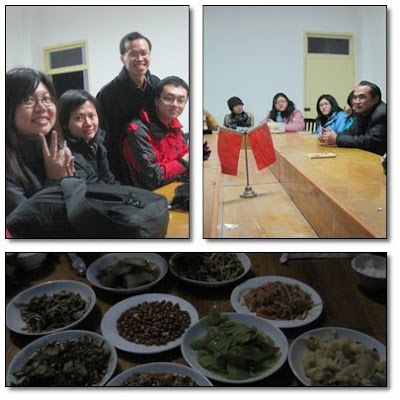 After which, PnP went to discuss the mural paintings of the dormitory and the library with He Zhu Ren (何主任). Due to an unexpected change in project scope, Gilbert (aka Ah Gong) and Wen Qing and Hwee Meng had to re-conceptualise the mural designs. 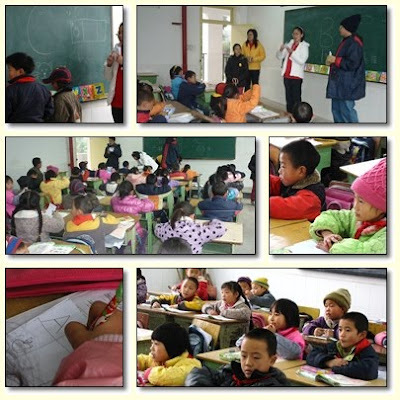 The rest of the team split our respective work groups (namely, 金刚战士，无敌战士，月光仙子) for interaction with the pre-school children and English lessons with the primary school children. The pre-school was located just beside the primary school, separated by a gate. 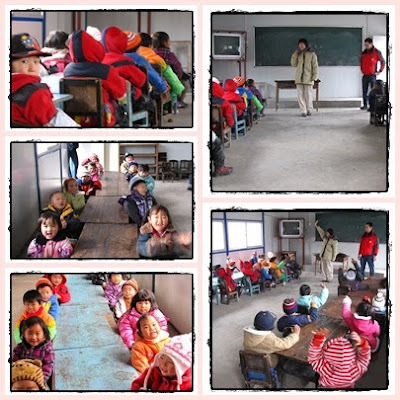 They were divided into 2 classes - 4 years old and 5-to-6years old. We taught them the ABC song, 泥娃娃, 一支手指变变变, Twinkle Twinkle Little Star, Hocky Pokey etc. Although it was a little difficult to capture their attention, it made our day to see their radiant smiles and chirpy voices calling out 新老师 - which we were called because the kids were too young to memorise all our names. Eventually, we did get better at teaching - the most important steps to capture their attention was 1) to change songs when they start to lose interest 2) repetitive works helped 3) start dancing hockey pokey because they loved the "Yo-o-o-o-o-o- hockey pokey" part 4) request for their songs and rhymes. And when all the above failed, which is almost never, it never hurts to have little tidbits as an exchange for good behaviour. Be very impressed by these little bouncing apples, especially after you have requested for them to recite their favourite rhyme/songs. Their loud, cheery voices echoed off the walls as they recited in perfect enunciation would brighten up the room in an instant - their merriment enchanted you and so infectious, that you would be subconsciously drawing up a smile onto your face. 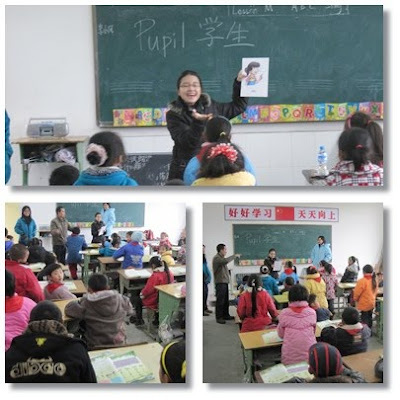 Some of us had English lessons with the primary school children. C&W had prepared a worksheet that involved answering of simple questions. However, to our dismay, the levels of competency in the language differed from class to class, and that most of them were unaware of the alphabets. Knowing that, was a quick change in plan to teach them the alphabets instead. The primary school children are very adorable as well ! Except for a couple of naughty kids, most of them are very keen learners and they had explicitly expressed an interest in learning the language. 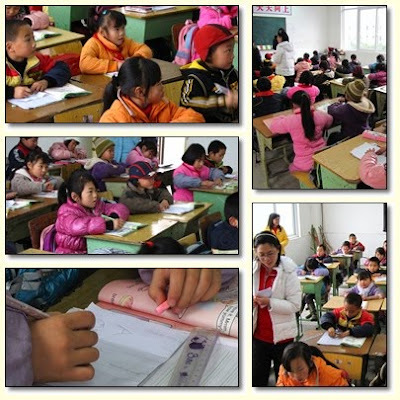 Some of the more studious children would even attempt to converse with us in English. We had a longer lunch because we needed to unpack our stuff. By 2.15pm, we walked back to the school. 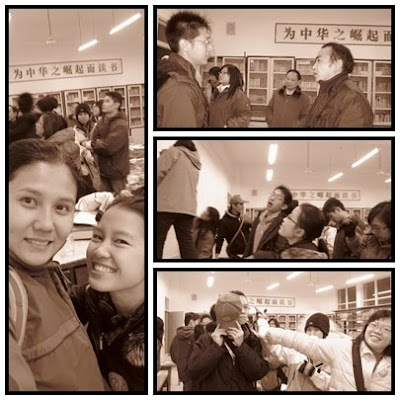 From there, we were separated into our Work Groups (金刚，无敌，月光) . 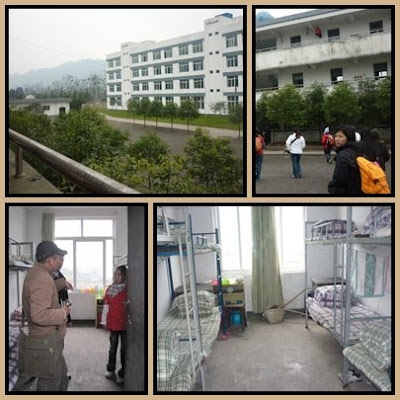 月光 & Ah Gong would be doing the drawing for the dormitory, whilst 金刚 & 无敌 worked in the ibrary. 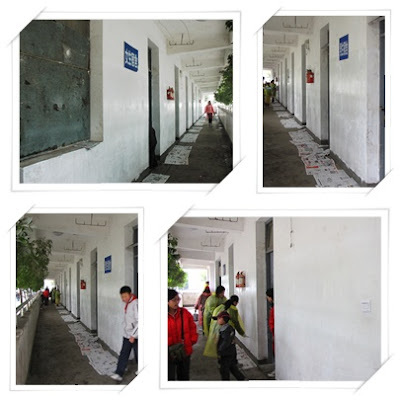 At the dormitory, 月光 - fully equipped with ponchos to protect the winter coats and plastic gloves, gave the dormitory walls a fresh clean coat of white wash. Some plastering work had to be done as well. 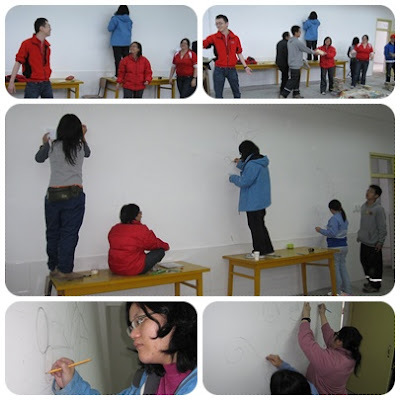 Following which, Ah Gong started to draw on the walls with help from his fellow project mates. 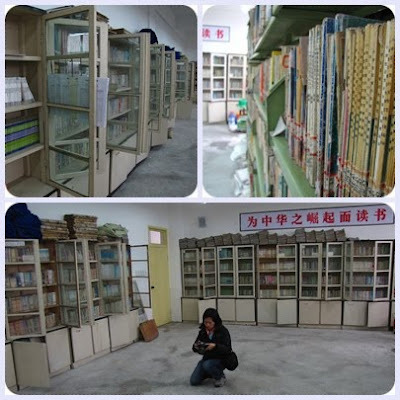 In the library, the books had to be taken off the bookshelves because the bookshelves were to be discarded and they were blocking the wall for the mural painting. Iris and Zack did a very good job in clearing a huge pile of magazines tucked away in the corner of the library. Before long, we realised individual efforts were too inefficient, so we started human chains! 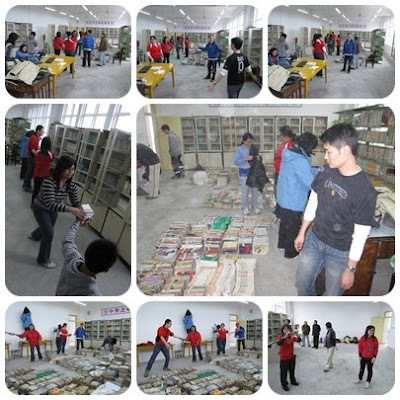 After that, we swept the floor carefully to prevent damage to the books on the floor. And started drawing ! Human chains continued. And then there were KOPI SOHs, who so nicely prepared hot drinks for us! Hot drinks are the best in winters because they can double up as hand warmers too ! 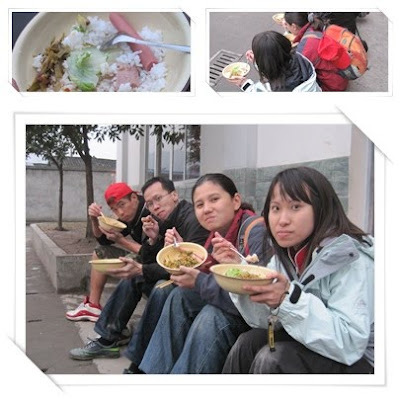 Around 6.30pm, we were told to have our dinner in the school tuckshop. After dinner, we had some time to spare. So we interacted with the children. While others stayed in the library practising the songs and discussing the programmes for the next day, drawing of mural continued in the library. 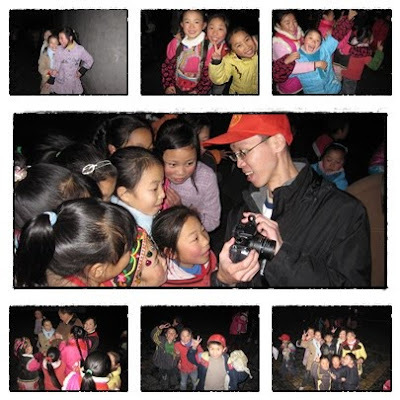 At 7.45pm, we left the school and walked back to the inn in the dark, carrying our torch lights. Debrief was held at 9.45pm. There was just a little problem, between 20 of us there were only 2 toilets. 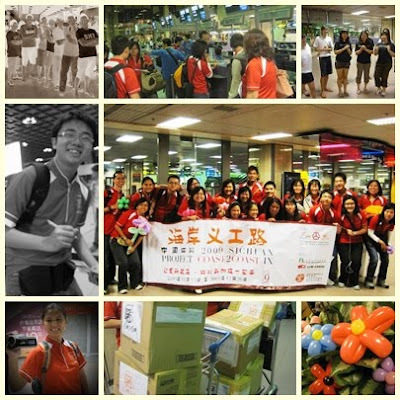 Disclaimer : Due to an oversight, Miss Paparazzi had forgotten to bring her camera, hence all the pictures are taken from facebook, namely: Ah Huat’s, Clythia’s, Joyce’s, Khoang’s, Kerui’s, Chelsea’s and please fill me in if I have forgotten your name. All rights reserved. No part of our pictures may be reproduced without the permission of the respective owners. 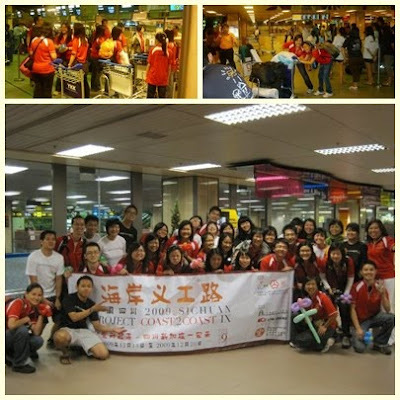 We gathered for an early check in on 13th Dec 2009, 12.30am at Changi Airport Terminal 1. 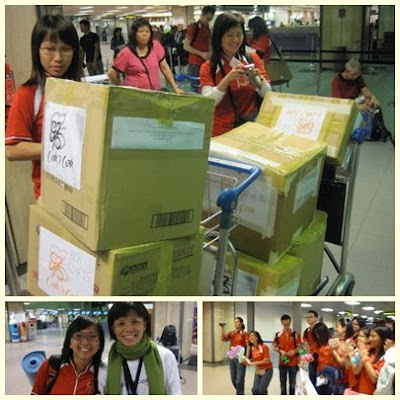 While we were crowding around Terminal 1 saying goodbyes to our beloved friends and family, the leaders were busy collecting our passports for group check-in; the logistics team was busy distributing pink ribbons, counting and recounting the boxes we were bringing over to China. Team X had given us a pleasant surprise with their balloony flowers, and sent us off with a “G-Double O-D J-O-B” cheer and a special dance. 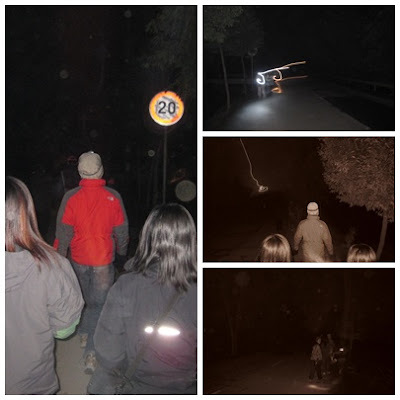 Reached 成都双流机场 at 6.50am in the morning, where we had our breakfast at KFC, changed into our trusty thermals and all. 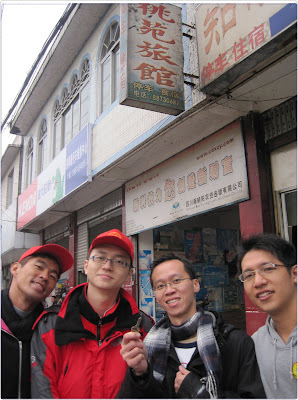 9.30am : Reached Hong Yan Mart (红艳超市) to stock up on our necessities, such as water, toilet paper and food. 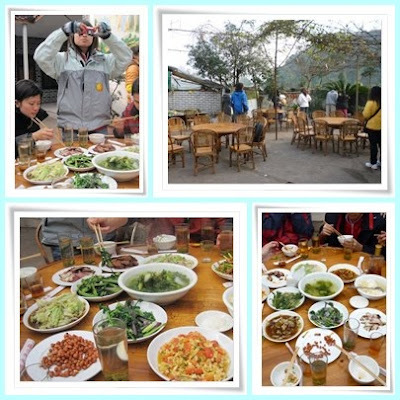 We arrived safely at Nong Jia Le (农家乐) at 11.15am for lunch. We were starving! 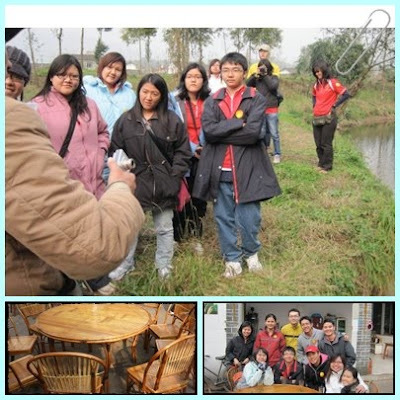 Some of us were exploring the place before lunch was served. 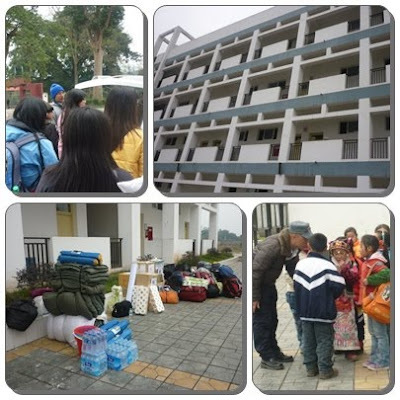 By 1.30pm, we reached You Zha Dong Guan Tai Shang Ai Xin Primary School (油榨东莞台商爱心小学), hence after referred to as You Zha Primary School（油榨小学）.We were warmly greeted by 何主任 and he kindly gave us a tour around the school and the dormitories. We also unloaded our luggage. For the first night, the girls’ lodging will be the science laboratory on the second floor, the guys on a spare room on the first floor. We then proceeded to set up the tents and later, in our respective workgroups, discussed the activities to be conducted over the next 7 days. The leaders went to the 公安/卫生院 to recee the places. P&P discussed with何主任 the design of the mural paintings and did amendments to the design. 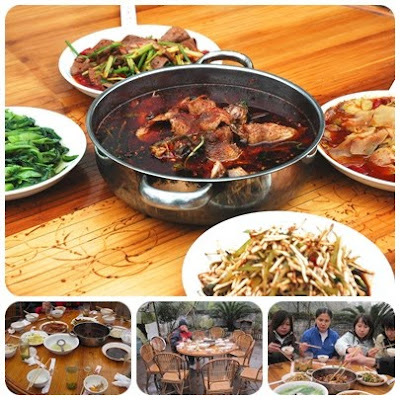 By 6.15pm, we walked to农家乐 for dinner. Dinner was served at 6.30pm. 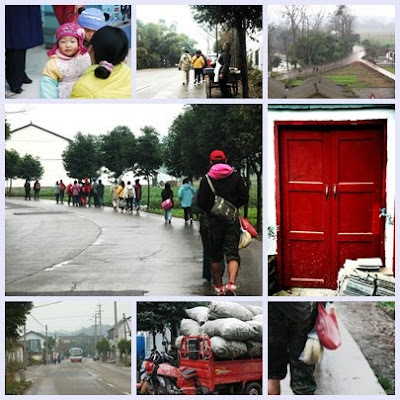 This is a typical scene along the walk from 农家乐 to school. 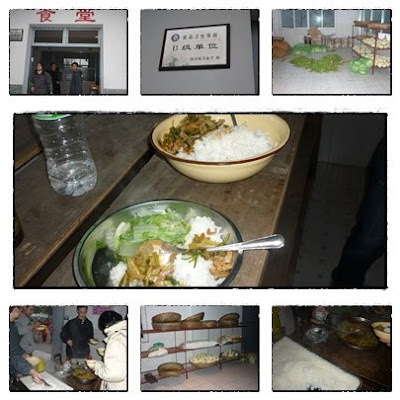 After dinner, approximately 7.30pm, we headed back to the school. 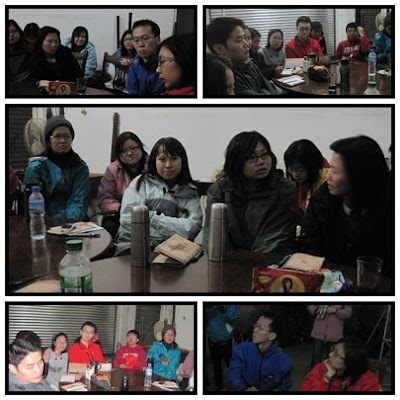 Exhausted but still in good spirits, we had our first debrief in the teachers’ room long table at 7.45pm to discuss the activities for the next day. 何主任 also gave us an introduction to the history behind You Zha Primary School (油榨小学),which was originally a 9-year school (the compulsory education in China) and later changed into a 6-year primary school to accommodate the children that were relocated to the mountains near 油榨乡. Jinnie also started her facilitation – our Angel and Mortal game, which provided entertainment while we were in Sichuan and suspiciously went “are you my angel?” for the next 13 days. After the meeting, the girls unpacked and lights out was 10pm.